In this paper, we demonstrate a standard method for producing an embolic middle cerebral artery occlusion with homologous blood clots (fibrin-rich) in adult rat. This model closely mimics human ischemic stroke and is suitable for preclinical study of thrombolytic therapy for ischemic stroke. Jin, R., Zhu, X., Li, G. Embolic Middle Cerebral Artery Occlusion (MCAO) for Ischemic Stroke with Homologous Blood Clots in Rats. J. Vis. Exp. (91), e51956, doi:10.3791/51956 (2014). Clinically, thrombolytic therapy with use of recombinant tissue plasminogen activator (tPA) remains the most effective treatment for acute ischemic stroke. However, the use of tPA is limited by its narrow therapeutic window and by increased risk of hemorrhagic transformation. There is an urgent need to develop suitable stroke models to study new thrombolytic agents and strategies for treatment of ischemic stroke. At present, two major types of ischemic stroke models have been developed in rats and mice: intraluminal suture MCAO and embolic MCAO. Although MCAO models via the intraluminal suture technique have been widely used in mechanism-driven stroke research, these suture models do not mimic the clinical situation and are not suitable for thrombolytic studies. Among these models, the embolic MCAO model closely mimics human ischemic stroke and is suitable for preclinical investigation of thrombolytic therapy. This embolic model was first developed in rats by Overgaard et al.1 in 1992 and further characterized by Zhang et al. in 19972. Although embolic MCAO has gained increasing attention, there are technical problems faced by many laboratories. To meet increasing needs for thrombolytic research, we present a highly reproducible model of embolic MCAO in the rat, which can develop a predictable infarct volume within the MCA territory. In brief, a modified PE-50 tube is gently advanced from the external carotid artery (ECA) into the lumen of the internal carotid artery (ICA) until the tip of the catheter reaches the origin of the MCA. Through the catheter, a single homologous blood clot is placed at the origin of the MCA. To identify the success of MCA occlusion, regional cerebral blood flow was monitored, neurological deficits and infarct volumes were measured. The techniques presented in this paper should help investigators to overcome technical problems for establishing this model for stroke research. Stroke is the third leading cause of death in the United States, but treatment options for acute stroke remain limited. At present, intravenous infusion of recombinant tissue plasminogen activator (tPA) to dissolve the blood clots is the most efficient therapy for acute ischemic stroke. However, the use of tPA is limited by its narrow therapeutic window and by increased risk of intracerebral hemorrhage. Therefore, a model of stroke suitable for thrombolytic research is urgently needed. The middle cerebral artery (MCA) is the artery most often occluded in stroke in humans. Focused on this artery, many animal models of ischemic stroke have been established. At present, two major types of rodent focal ischemia models by occluding MCA have been developed: suture MCAO model and embolic MCAO model. Although MCAO models via the intraluminal suture technique have been widely used in mechanism-driven stroke research, these suture models do not mimic human stroke, as up to 80% of human strokes are caused by thrombosis or embolism. However, embolic stroke model using blood clots closely mimics human stroke and is considered suitable for thrombolytic study. This embolic model was first developed in rats by Overgaard et al.1 in 1992 and further characterized by Zhang et al. in 19972 and by Dinapoli et al. in 20063. Although embolic MCAO has gained increasing attention, there are technical problems faced by many laboratories. In this article, we demonstrate a standard method for producing embolic MCAO with homologous blood clots in the adult rat, which can develop a predictable infarction within the MCA territory. The techniques presented in this article should help investigators to overcome technical problems for establishing this model for stroke research. Ethics Statement: Male adult Sprague-Dawley rats (weighing 330-380 g) were used in this protocol. This protocol was approved by the Institutional Animal Care and Use Committee (IACUC) at the LSU Health Science Center-Shreveport and is in compliance with the 'Guide for the Care and Use of Laboratory Animals' (eighth edition, National Academy of Sciences, 2011). Hold a 30 cm long PE-50 tube above a gas fire by hands, gradually soften the tube. Gently stretch the tube. Select a point on the stretched tube using a digital caliper (Figure 1), mark it, and cut the modified PE-50 tube into a 25 cm long segment with a 1 cm long tip (outside diameter: 0.30-0.34 mm). Anesthetize the rat with isoflurane (5% for induction, 2-3% for maintenance) in 70% N2O and 30% O2 by a face mask prior to blood collection. Confirm anesthesia by a toe pinch. Perform femoral arterial cannulation of a donor rat with published method4 and transfer femoral artery blood directly into a 20 cm long PE-50 tube. Place the tube for 2 hr at room temperature to clot blood, and then retain the tube for 22 hr at 4 °C. Note: Cannulation is performed using aseptic technique as described in step 3.1. The donor rat is recovered for further sampling. Cut the PE-50 tube into 50 mm segments and flush out the clot from the tube into a sterile Petri dish containing normal saline. 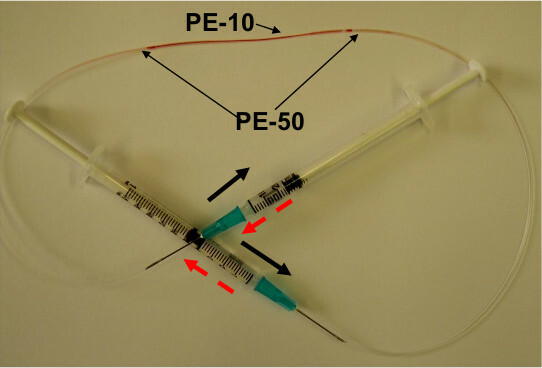 Transfer the 50 mm long clot into a 60 mm long PE-10 tube and connect each end of the PE-10 tube to a 20 cm long PE-50 tube connected to 1 ml syringe containing normal saline with 23 G needle (Figure 2). Shift the clot by continuous alternating movement from one syringe to the other for 5 min, which can remove blood cells from the clot and minimize the fragile of extravascular coagulated clot, without disrupting the fibrin core. Cut the clot into a 40 mm long segment and transfer the clot segment into a modified PE-50 catheter as described in step 1.2 under aseptic conditions. Note: All PE tubing is sterilized with ethylene oxide. Sterilize all surgical tools by autoclaving (minimum 121 °C, 15 PSI, for 15 min). Sanitize the surgery table and associated surgical equipment using 70% ethanol. Anesthetize the rat with isoflurane as described in step 2.1. Test the depth of anesthesia by performing a toe pinch on both rear feet, and any observed movement (withdrawing the paw) indicates that the animal is not sufficiently anesthetized to do surgery. Apply a small amount of vet ointment on both eyes to prevent dryness while under anesthesia. Shave the fur on the ventral neck and head regions with electric clippers to expose the skin areas. Place the rat in the supine position on a heating pad. Insert a rectal probe, control and maintain body temperature between 36.5-37.5 °C using a homeothermic blanket control unit. Disinfect the shaved skin and surrounding fur with 10% povidone-iodine followed by 70% ethanol. Make a 2-cm-long midline incision on the neck under a dissecting microscope. Use retractors to expose the surgical field and dissect the right common carotid artery (CCA), external carotid artery (ECA), internal carotid artery (ICA), and pterygopalatine artery (PPA) free from surrounding nerves and fascia (Figure 3A). Note: Before surgery, change sterile gloves if no assistant helps to prepare the animal. Dissect the CCA free from the surrounding nerves (without harming the vagal nerve) and place a sterile 5-0 silk suture under the artery. Tie a slip knot (#1) and grasp the suture using a small hemostat and pull taught toward the body. Dissect the ECA and its two branches, the occipital artery (OA) and the superior thyroid artery (STA). Coagulate two branches using a veterinary electrosurgical unit. Place two pieces of sterile 6-0 silk sutures under the ECA. Separate the two silks placed under the artery, one piece towards the head (distal end) and the other towards the body. Tie a tight ligature (#2) on the side closest to the head, grasp the silk with small hemostats and pull taught toward the head. Prepare a loose knot (#3) with the other silk to use later. Dissect the ICA and PPA from the surrounding nerves (without harming the vagal nerve). Tie the PPA with a 6-0 suture (#4). Make a slip knot with 6-0 suture around the ICA (#5). Alternatively, clip the ICA using a microvascular clip. Cut a small hole (1/2 thru) into the ECA between the tight (#2) and loose (#3) ligatures with a Vannas-style spring scissors. Insert the modified PE-50 tube containing blood clot into the incision and advance to the bifurcation of the CCA. Tighten the loose ligature (#3) around the lumen just enough to secure preserve mobility of the in-dwelling tube. Cut off the ECA at the site of small hole to free the stump and position the stump below the bifurcation of the ECA and ICA; this will allow the modified tube easily slide into the ICA. Open the ICA and gently advance the tube from the lumen of the ECA into the ICA until the tip of the catheter reaches the origin of the MCA (~17 mm from the bifurcation). Note: Before insert the tip of tube into the ECA, sterile the outer surface of tube with 70% ethanol, and then wash with sterile normal saline. Inject the clot through the modified PE-50 catheter along with 10 μl of saline over 10 sec using a 100 μl Hamilton syringe (Figure 3B). Withdraw the catheter from the ECA 5 min later. Tie the ECA and reopen CCA. Suture the incision on the neck. Prior to MCA occlusion, make a 1.2 cm long midline incision in the scalp to expose the skull bone. Remove the tissues on the skull bone with a dental scraper and sterile cotton swaps. Note: Before surgery, the exposed scalp area and surrounding fur are disinfected with 10% povidone-iodine followed by 70% ethanol. Drill a 1.5 mm diameter burr hole located at 2 mm posterior and 5 mm lateral to the bregma using a 0.7 mm spherical stainless steel burr (Figure 4). NOTE: Keep the dura intact. Place the probe 0.5 mm above the dura surface. Monitor the rCBF at 0 (baseline), 5, 15, 30, 60, 90, and 120 min after embolization and continue at 5, 15, 30, 45, and 60 min after intravenous administration of tPA. After the last measurement of rCBF, the scalp incision is closed by suture. Note: Prior to neck incision we measure rCBF as baseline before MCA occlusion. Post MCA occlusion we measure rCBF after suture closure of neck incision. Thus, the neck incision is kept sterile. Inject 2.5 ml of saline solution subcutaneously to prevent dehydration and inject Buprenex (0.05 mg/kg, SC) immediately after the surgery and every 6-12 hr as needed for pain relief. Stop isoflurane anesthesia. Place the rat in a 37 °C veterinary recovery chamber (keep animal warm) and keep observation. It generally takes 10 min for the rat to recover from anesthesia. Then, put the animal into a sterilized cage, place some wetted food in a Petri dish in the cage, and return the cage to animal sterilization room. 24 hr after stroke, euthanize the rat with an overdose of sodium pentobarbital (100 mg/kg body weight, IP). Perform the Bederson score before and at 2 hr after embolization. Use a grading scale of 0-3 as previously described5: 0, raising the rat by tail, the animal extending both forelimbs to the floor and exhibiting no other deficits (normal movement); 1, raising the rat by tail, flex the contralateral forelimb; 2, decreased resistance to lateral push (and forelimb flexion) without circling; 3, the same behavior as grade 2 with circling. NOTE: Rats showing Bederson score = 0 (no deficit) at 2 hr after embolization are excluded from further study. Laser Doppler flowmetry (LDF) was used to monitor rCBF during induction of cerebral ischemia6,7. Many laboratories including our laboratory have been using rCBF to identify animals with successful MCA occlusion, but the thresholds of baseline varied between laboratories which are related to the site of measurement. 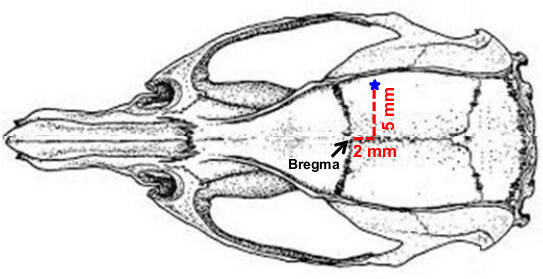 The probe of the LDF is positioned at 2 mm posterior and 5 mm lateral to the bregma as described previously6. rCBF was monitored at 0, 5, 15, 30, 60, 90, and 120 min after injection of the clot. On the basis of this data, only animals that exhibit a reduction in rCBF >70% of baseline are considered successful embolic occlusion of the MCA (Figure 5). At 2 hr after injection of clot, a standard rat dose of tPA (10 mg/kg)7,8 was administered intravenously with a 10% bolus and 90% continuous infusion over 30 min using a syringe infusion pump7,8. We observed that rCBF levels gradually increased to >70% of the baseline within 30 min of tPA therapy (Figure 5). At 24 hr after embolization, the animals were euthanized and transcardially perfused with 200 ml of PBS to remove intravascular blood. Previous studies2,3,7,8 and our data (Figure 6) have shown substantially larger tissue infarctions produced at 24 hr after embolization. The brains were collected and taken pictures. In saline-treated group, the blood clot was readily visualized at the origin of the MCA and ACA, but the clot was almost completely dissolved in tPA-treated group (Figure 6A). After that, the brain was sliced into seven 2 mm coronal sections with a rat brain matrix on ice. Incubate the brain slices in 2% 2,3,5-triphenyltetrazolium chloride (TTC) at 37 °C for 30 min9,10. After TTC staining, the coronal sections were placed on a plate and photographed (Figure 6B). The area of infarction in each slice was determined by the computerized image analysis system (National Institutes of Health Image), and the average infarct volume was calculated by multiplying the distance between sections. This embolic stroke model produced tissue infarction within the MCA territory as seen in the neocortex and striatum regions (Figure 6B). Early reperfusion was established by intravenous administration of tPA at 2 hr after embolization, the infarct volumes were significantly reduced in the tPA-treated group (229.1 ± 45.7 mm3, n = 12) compared with the saline-treated group (394.2 ± 68.2 mm3, n = 9) (P < 0.01). The 24 hr mortality rate is 16% (4/25). Figure 1. 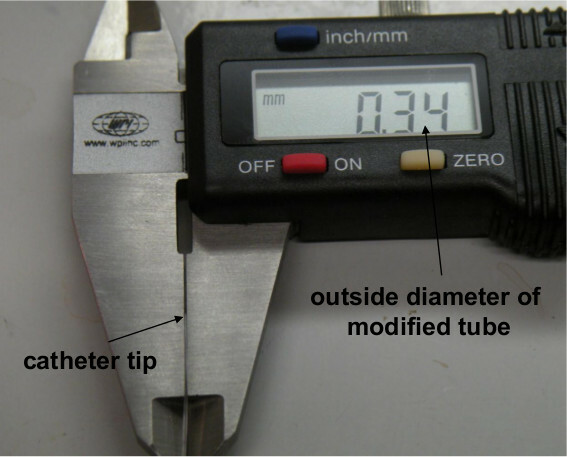 Measurement of the outside diameter of the modified PE-50 tube using a digital caliper. Figure 2. Washing blood clot in a PE-10 tube. The blood clot was washed by alternative pushing the two syringes connected to the end of PE-50 tube. Figure 3. (A) Simplified scheme of rat right hemisphere isolated arteries showing successive sutures to prepare the introduction of modified PE-50 tube. 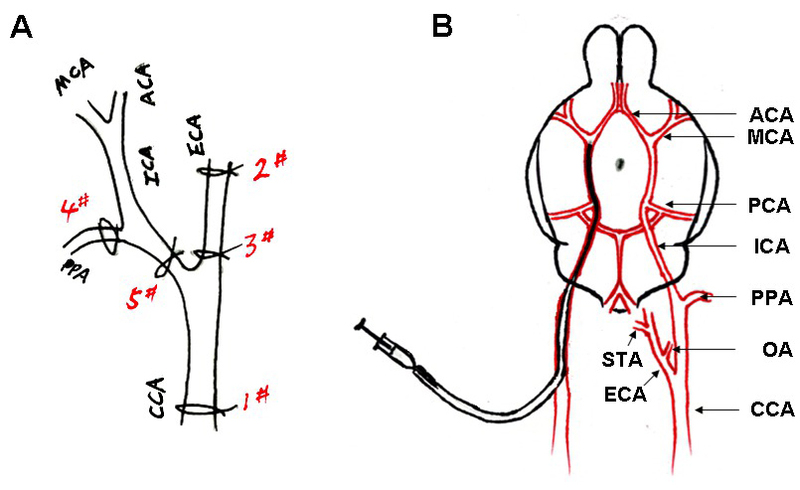 (B) Scheme of the arterial architecture in the rat brain, and the catheter advanced from the ECA to the ICA of the rat. A single blood clot (black) was contained in the tube. Figure 4. The burr hole (1.5 mm diameter) located at 2 mm posterior and 5 mm lateral to the bregma. Figure 5. Regional cerebral blood flow (rCBF) was measured using a laser Doppler flowmeter (LDF). The clot injection led to >70% rCBF reduction of the baseline value. tPA (10 mg/kg) treated at 2 hr after the clot injection restored rCBF close to baseline after 30 min of tPA treatment. Data was expressed as mean ± SD. Figure 6. (A) Representative pictures showing the blood clots (black arrows) in the origin of the middle cerebral artery (MCA) and anterior cerebral artery (ACA) at 24 hr after stroke. Left, saline-treated rat; Right, tPA-treated rat, bar = 5 mm. (B) Representative images showing TTC-stained brain slices at 24 hr after stroke. Left, saline-treated rat; Right, tPA-treated rat, bar = 5 mm. In this study, we demonstrated a standard method for performing an embolic MCAO stroke model in the rat, in which the origin of the MCA is occluded by a fibrin-rich clot. The major advantage of this model is: the occlusion of the stem of MCA with a fibrin-rich blood clot is similar to thromboembolic stroke in humans, the embolic stroke model is suitable for performing preclinical investigation of fibrinolytic therapy, and that this model can develop a reproducible and predictable infarct volume within the territory supplied by the MCA. For performing the embolic MCAO model, the clot introduction, stability and lodgment are difficult to manage, which leads to variations in infarct size and affected brain regions2,3. Previous studies demonstrated that reproducible ischemic lesions in the MCA territory could only be achieved when the obstructing clots are lodged in the stem of MCA2,3. To precisely lodge the clot and produce a reproducible embolic stroke model, in this study, we demonstrate how to prepare a modified PE-50 tube and how to introduce the tip of the modified tube to the origin of MCA and how to inject a fibrin-rich clot into the MCA. Consistent with the previous report2, the injected blood clot was readily visualized at the origin of the MCA in all saline-treated rats (n = 9) but was largely dissolved in all tPA-treated rats (n = 12) at 24 hr after embolization. To evaluate the success of MCAO, the rCBF, neurological deficits, and the pattern and distribution of cerebral lesions were assessed. After the clot injection, rCBF was decreased to 30% of baseline and this decrease of rCBF persisted for at least 2 hr after embolization, consistent with previous reports6,7. After treatment with tPA at 2 hr after embolization, the levels of rCBF were restored close to baseline after 30 min of tPA treatment. Neurological score was measured 10 min before drug treatment using the modified Bederson score to help evaluating the success of MCAO. This neurological scoring is a simple and quick way to detect global neurological function in acute phase of stroke. Animals showing normal behaviors (score = 0) were excluded from drug treatment and further analysis. Moreover, we demonstrated that the tissue lesion was produced mostly within the MCA territory as seen in the neocortex and striatum regions, and tPA treatment (at 2 hr) significantly reduced the infarction size at 24 hr after stroke. Together, our data demonstrated that the embolic stroke model presented in this work can develop a predictable infarct volume within the MCA territory. Finally, we note that there are several technical concerns that may affect the success of the embolic MCAO model. A common problem encountered in performing embolic MCAO model is early spontaneous reperfusion after embolization. The occurance of spontaneous reperfusion is likely to be associated with the fragile of extravascular coagulated clot and the length of the clot used to occlude the MCA2,3,10. We believe that the method we described (step 2) to prepare blood clot would minimize the fragile of extravascular coagulated clot. The length of single blood clot used to occlude MCA varied from lab to lab between 25-mm to 50-mm length2,3,6-8,10. We found that the use of a 35-40 mm long clot ideally occluded the MCA and produced highly reproducible infarct volume. Modifying the PE-50 tube with the tip diameter between 0.30-0.34 mm. If the tip diameter is >0.34 mm, it cannot reach the origin of the MCA. If the tip diameter is <0.30 mm, the clot inside the modified PE-50 tube is difficult to go through the tip. The mortality rate is closely related to severe brain swelling and intracerebral hemorrhage. In this work, the 24 hr mortality rate is 16% (4/25; see representative results), and all dead rats showed severe brain swelling although we didn’t see intracerebral hemorrhage (possibly due to limited sample size). A controllable mortality factor is body temperature during the surgery. In controlling the body temperature between 36.5-37.5 °C from the start of surgery until full recovery from anesthesia. Body temperature significantly affects on the extent of brain tissue damage. Hypothermia decreases and hyperthermia increases the infarct volume11,12. Performing the surgery in a short time period (about 20-25 min) according the protocol in order to produce highly reproducible infarct size. Infectious complications are a leading cause of death in patients with acute stroke13. To reduce the incidence of infectious complications and enhance the survival rate after stroke, aseptic technique should be used during surgery. In conclusion: the techniques presented in this article should help investigators to overcome technical problems for establishing this model for stroke research. We do not have any potential conflicting interests to disclose. This work was supported by National Institutes of Health grants HL087990 (G.L.). Overgaard, K., Sereghy, T., Boysen, G., Pedersen, H., Høyer, S., Diemer, N. H. A rat model of reproducible cerebral infarction using thrombotic blood clot emboli. J Cereb Blood Flow Metab. 12, (3), 484-490 (1992). Zhang, R. L., Chopp, M., Zhang, Z. G., Jiang, Q., Ewing, J. R. A rat model of focal embolic cerebral ischemia. Brain Res. 766, (1-2), 83-92 (1997). Dinapoli, V. A., Rosen, C. L., Nagamine, T., Crocco, T. Selective MCA occlusion: a precise embolic stroke model. J. Neurosci. Methods. 154, (1-2), 233-238 (2006). Jespersen, B., Knupp, L., Northcott, C. A. Femoral arterial and venous catheterization for blood sampling, drug administration and conscious blood pressure and heart rate measurements. J Vis Exp. 59, (3496), (2012). Bederson, J. B., Pitts, L. H., Tsuji, M., Nishimura, M. C., Davis, R. L., Bartkowski, H. Rat middle cerebral artery occlusion: evaluation of the model and development of a neurologic examination. Stroke. 17, (3), 472-476 (1986). Henninger, N., Bouley, J., Bråtane, B. T., Bastan, B., Shea, M., Fisher, M. Laser Doppler flowmetry predicts occlusion but not tPA-mediated reperfusion success after rat embolic stroke. Exp Neurol. 215, (2), 290-297 (2009). Zhu, H., et al. 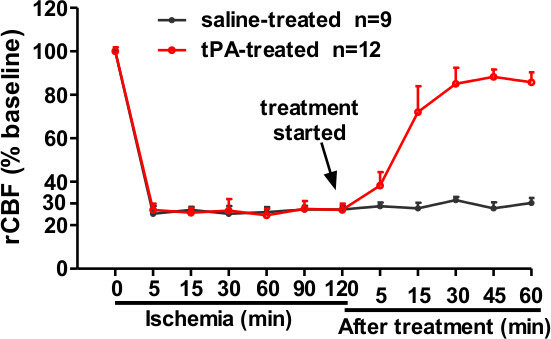 Annexin A2 combined with low-dose tPA improves thrombolytic therapy in a rat model of focal embolic stroke. J Cereb Blood Flow Metab. 30, (6), 1137-1146 (2010). Cheng, T., et al. 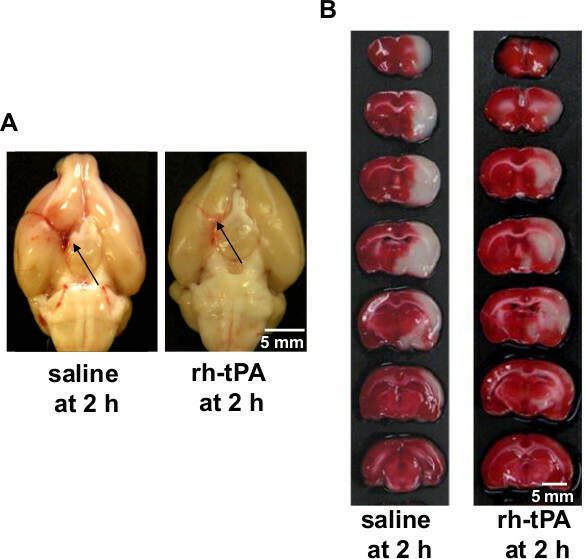 Activated protein C inhibits tissue plasminogen activator-induced brain hemorrhage. Nat Med. 2, (11), 1278-1285 (2006). Taniguchi, H., Andreasson, K. The hypoxic-ischemic encephalopathy model of perinatal ischemia. J Vis Exp. 21, (955), (2008). Sicard, K. M., Fisher, M. Animal models of focal brain ischemia. Exp Transl Stroke Med. 1, (7), (2009). Florian, B., et al. Long-term hypothermia reduces infarct volume in aged rats after focal ischemia. Neurosci Lett. 438, (2), 180-185 (2008). Noor, R., Wang, C. X., Shuaib, A. Effects of hyperthermia on infarct volume in focal embolic model of cerebral ischemia in rats. Neurosci Lett. 349, (2), 130-132 (2003). Westendorp, W. F., Nederkoorn, P. J., Vermeij, J. D., Dijkgraaf, M. G., van de Beek, D. Post-stroke infection: a systematic review and meta-analysis. BMC Neurol. 11, (110), (2011). Posted by JoVE Editors on 11/01/2014. Citeable Link. A correction was made to Embolic Middle Cerebral Artery Occlusion (MCAO) for Ischemic Stroke with Homologous Blood Clots in Rats. The institution information was updated. The institution "Louisiana State University Health Science Center" was changed to "Louisiana State University Health Science Center, Shreveport".